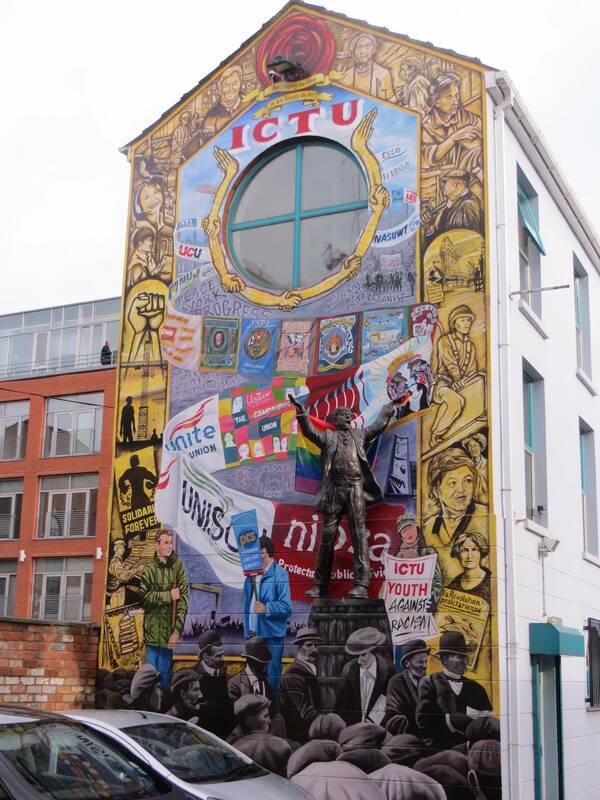 After decades in the economic doldrums due to industrial decline and The Troubles, the Good Friday Agreement in 1998 provided renewed confidence and a kick-start to investment in Belfast. 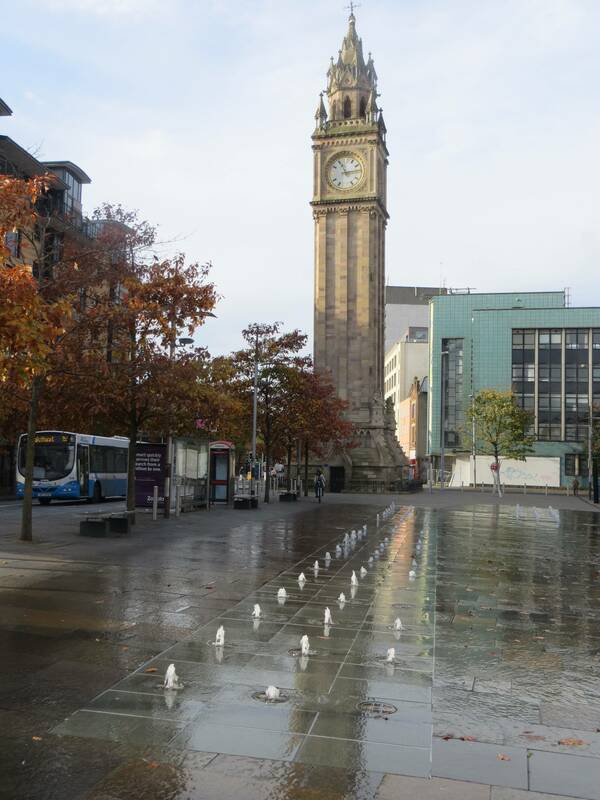 This has led to a period of sustained economic growth and large-scale redevelopment of the city centre. 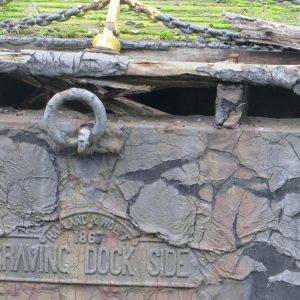 You will be struck on this walk by the sheer scale of the dockland areas, the relative wealth of the city itself, and the legacy of nineteenth-century buildings when the city became rich through the manufacture of Belfast Linen and engineering businesses. Some famous inhabitants: Kenneth Branagh (actor), Brian Keenan (hostage and writer), C.S. Lewis (children’s writer), Van Morrison (musician), Liam Neeson (actor), Gerry Adams (politician), David Trimble (politician), George Best (footballer), Alex Higgins (snooker) , Lord Kelvin (scientist), Louis MacNeice (poet). 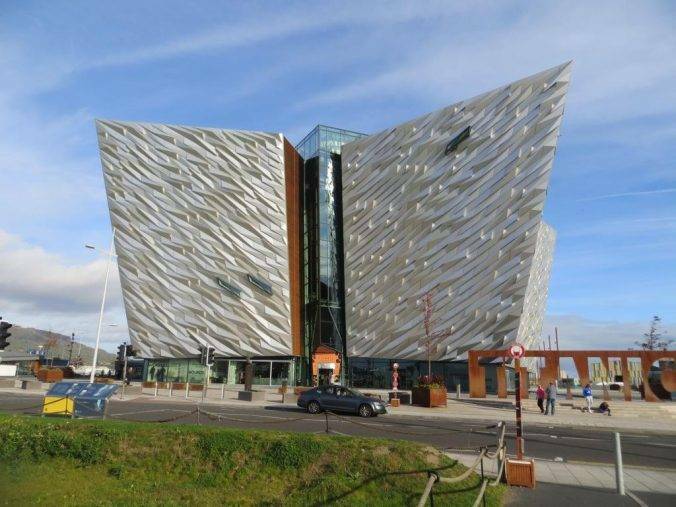 Belfast began life in the 17th century as a market town but blossomed as a commercial and industrial centre in the 18th and 19th centuries to become Ireland’s pre-eminent industrial city, famous for its linen trade and shipbuilding. Until the early 19th century, linen production in Ireland was a domestic industry based on the farm. What gave Belfast its pre-eminence was the automation of the process. In 1825, James Kay invented a method of ‘wet spinning’ which passed the flax through warm water and enabled a much finer yarn to be spun. By the late 1820s, several ‘wet’ spinning mills using water power had been built in Ulster. By 1871 there were 78 mills with a workforce of 43,000. Belfast became the largest linen producing centre in the world, earning the nickname ‘Linenopolis’. During this same period, Belfast’s harbour was dredged to provide deeper berths for larger ships. Donegall Quay was built out into the river as the harbour was developed further and trade flourished. The Harland and Wolff shipbuilding firm was formed in 1861, and by the time the Titanic was built here, in 1912, it had become the largest shipyard in the world, employing 35,000 workers. Consequently, the population of Belfast grew very rapidly in the nineteenth century, and it quickly transitioned from market town to industrial city. Because of this, it is less an agglomeration of villages and towns which have expanded into each other, compared to say Manchester or Birmingham. The city expanded to the natural barriers of the hills that surround it, overwhelming other settlements. Consequently, the arterial roads along which this expansion took place (such as the Falls Road and the Newtownards Road) are more significant in defining the districts of the city than nucleated settlements. Belfast saw some of the worst of the sectarian Troubles in Northern Ireland, with nearly half of the total deaths in the conflict occurring in the city. However, since the Good Friday Agreement in 1998, there has been widespread urban regeneration, including Victoria Square, Queen’s Island and Laganside, as well as the Odyssey complex and the landmark Waterfront Hall. Peter, an old Northern Irish friend and guide for the day, had not been to Belfast for a long while (he’s more a Derry and Donegal man). For him, the character of the city had changed beyond recognition since his youth – not so much the Victorian buildings, which are still the familiar landmarks that they had been back then, but the tone and feeling of the place – it has basically become an outward-looking, modern city. Most spectacularly, what had been a derelict area of docklands now has a completely new lease of life; with the Odyssey arena, a hotel, a science centre and the architecturally-striking Titanic Belfast having been built there in the last few years. Designed by Frank Gehry, it is intended to serve a similar transformational function to that of the Guggenheim Museum in Bilbao, as a focus for the regeneration of the city. Its external facade is clad with several thousand three-dimensional aluminium plates of varying size and shape, creating a startling textured effect. With a clear blue sky behind, it is most impressive. The building’s design is intended to reflect Belfast’s history of ship making and the industrial legacy bequeathed by Harland & Wolff. 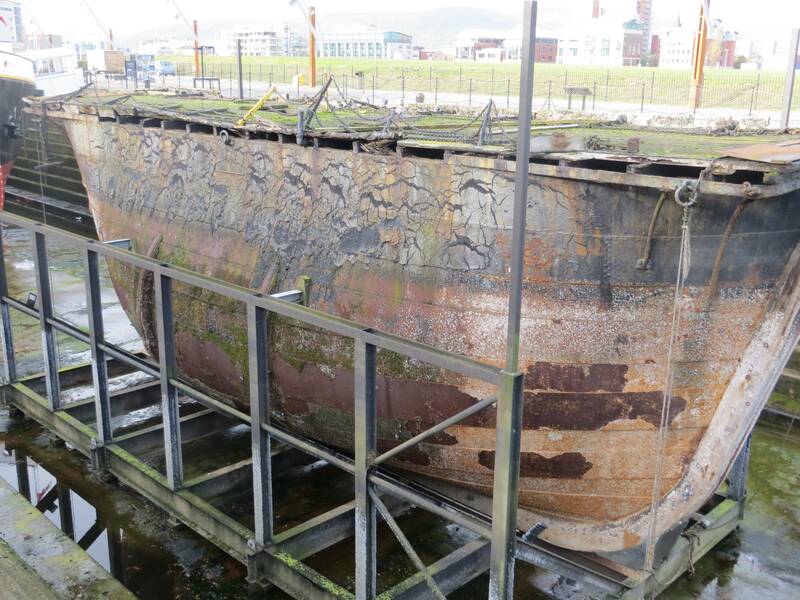 Its angular form recalls the shape of ships’ prows, with its main ‘prow’ angled down the middle of the Titanic and Olympic slipways towards the River Lagan. It stands 126 feet high, the same height as Titanic’s hull. 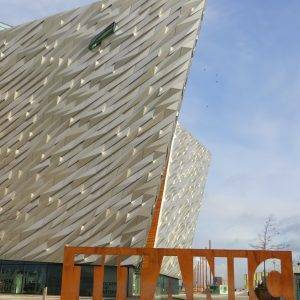 If you feel the need to be re-acquainted with the Titanic story, or to delve deeper into it, then Titanic Belfast has plenty to offer. It also has a good history section on Belfast, including the story of its pre-eminence in the linen trade. 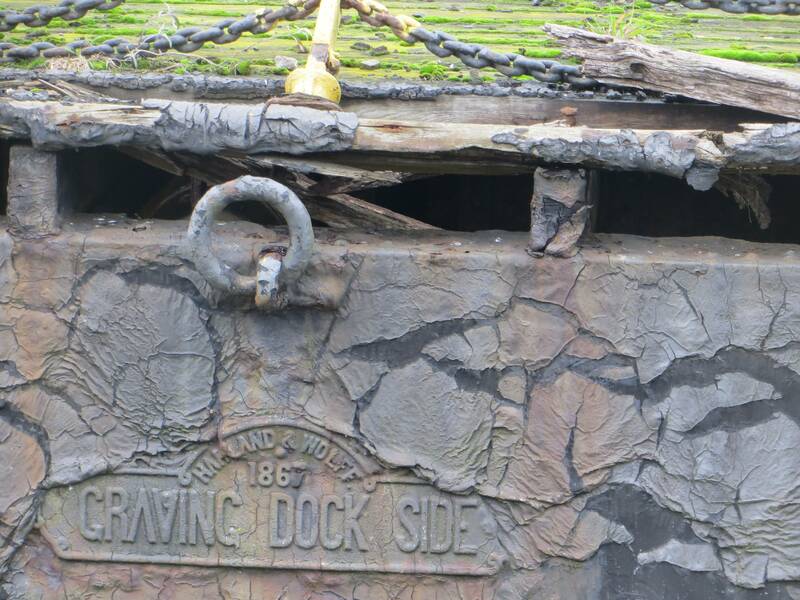 Somehow the slipway outside really brings the story of the Titanic to life, as does a 5-minute walk up to the dry dock where it was fitted out, just to the east. 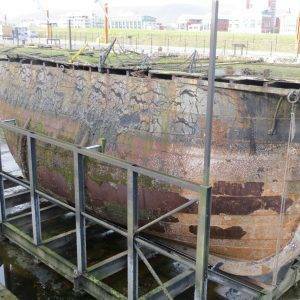 To stand in the dry dock that the Titanic was fitted-out in trumps (at least for me) the main Titanic visitor centre. Towering above everything and a very good marker point for the start of our walk are the massive Harland & Wolff Samson and Goliath gantry cranes, once at the very heart of the shipyard operation but now only used occasionally. They have a combined lifting capacity of over 1,600 tonnes, one of the greatest in the world; and the dry dock at their base is the largest in the world, measuring 556 m × 93 m. They are now scheduled as Historic Monuments. 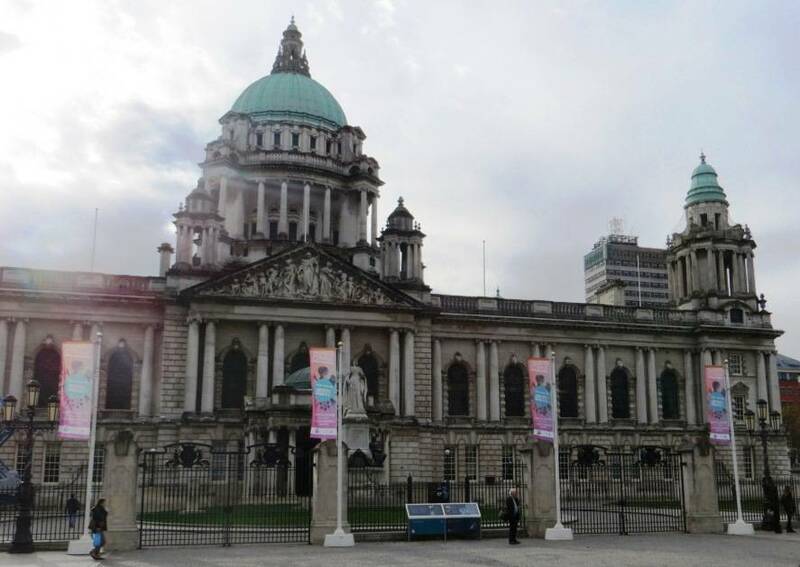 As Northern Ireland Office Minister at the time of their listing Angela Smith stated: “These cranes are an essential part of our city, our roots and our culture.” They are also an exceptionally good landmark for this walk, visible from miles around. 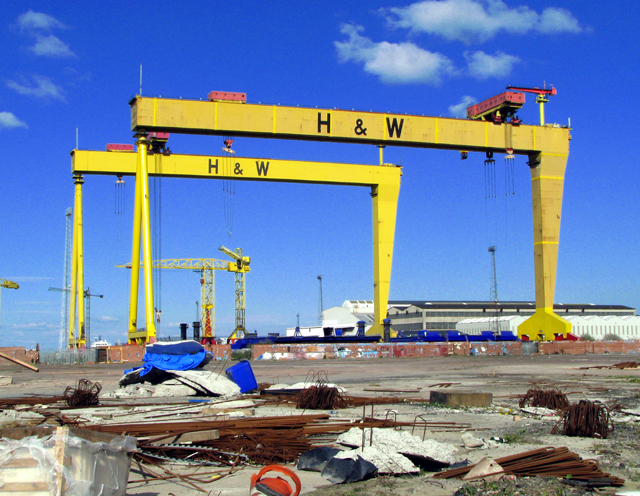 At its height, Harland & Wolff boasted 35,000 employees and a healthy order book, but in the years following the cranes’ construction in the 1960s, the business and workforce declined. The yard has now restructured itself to focus less on shipbuilding and more on design and structural engineering – today the expanding offshore wind power industry accounts for 75% of the company’s work. 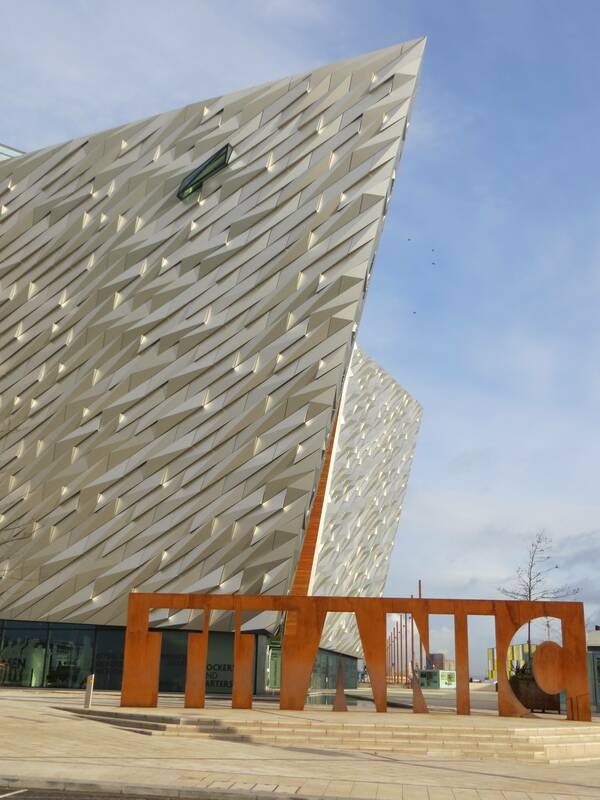 Belfast’s shift from industry to culture is palpable wherever you walk, none more so than in the new use of the former Harland and Wolff Paint Hall alongside the Titanic Centre as one of the UK Film Council’s main studios. TV series filmed here have famously included the fantasy ‘Game of Thrones’ series. Moving on from the docklands area, we crossed the new Lagan Weir Bridge, broad, elegant and slightly curved. It can be used by cyclists as well as pedestrians, an improvement on the much narrower bridge that had been there before. The Lagan Weir, completed in 1994, is a series of massive steel barriers which are raised as the tide retreats to keep the river at an artificially constant level – being tidal the water level varied by up to three metres between high and low tide. This exposed mudflats which were unsightly and smelly. This improvement to the sewerage system, combined with massive dredging of the river and installation of an underwater aeration system, has led to a marked improvement in water quality and the environment around the river, with salmon returning, followed by otters and seals. The improvement has also been a catalyst for residential development along the riverside. A similar scheme to a much older one on the River Thames at Richmond (which we pass on another one of our walks). As we crossed the bridge, we saw on the far bank, just to our right, an arched culvert emerging into the River Lagan. This is the terminus of the River Farset, which now runs underground along the High St and past the clock tower to reach this point. Belfast was founded at a sandy ford across the Farset, and this is the origin of the city’s name – Béal Feirste, the Mouth of the Farset. Farset itself comes from an Irish word meaning sandbar. Old drawings show a bustling river which powered Belfast’s industrial development and ferried traders into what is now the High Street. Over the course of the 18th century, the river was gradually covered over, a process that was completed by the start of the 19th century. The Big Blue Fish greets you (if a fish can do greetings) as you reach the far side of the bridge. This sculpture was commissioned in 1999 to celebrate the regeneration of the River Lagan and the historic importance of the site at the confluence of the River Lagan and Farset. 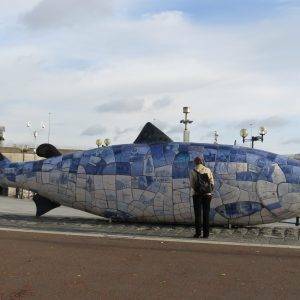 Trip Advisor comments are at their polar opposite best with regard to The Big Blue Fish, split between cultural reverence and touristic ennui: “It’s a fish… and not a particularly nice one at that. 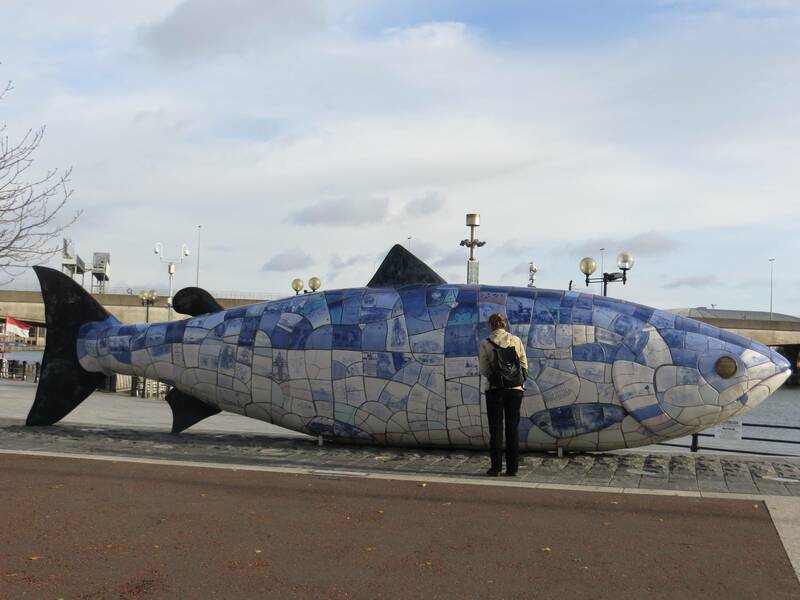 Hardly worth glancing at.” “Nothing to see here, just a massive mosaic fish.” “This was no more or less than I expected from a fish made of stone.” “It’s literally a fish like if this is all Belfast has to offer it’s a bloody sad day…” Others, however, are much more positive: “It’s a beautiful sculpture and if you take the time to look closely at each mosaic tile you will learn a little bit of Belfast history. It’s just lovely and people really seem to love it (plus my friend got engaged there so it’s pretty special! )” I leave you to be the judge of The Big Blue Fish – we happily posed in front of it so it definitely passes muster at least as a photographic prop! Across the way is The Customs House, an imposing Victorian building, designed in 1857 by the architect Sir Charles Lanyon (his name keeps cropping up in this walk, as you will discover) in the Italian Renaissance style, made possible and necessary as Belfast became one of the great industrial and trading centres of the Victorian age. The writer Anthony Trollope worked here for the General Post Office (there is a blue plaque) in the 1850s. As well as being a novelist, Trollope’s claim to fame is as the inventor of the iconic red pillar-box. Next, we strolled up Skipper St and this is very much a reminder that the ‘new’ Belfast is alive and kicking; full of bars, nightclubs and trendy warehouse restaurants. We stopped for coffee in the über cool ‘Established Coffee’ just by the cathedral, with its glass walls, polished concrete floor and communal seating space; and enjoyed the best, strongest coffee in a long while, wedged in among the hipsters and social media gurus tapping away on their tablets and groping around with their spare hand for that elusive coffee cup. The cultural centrepiece of this area, which has become billed the ‘Cathedral Quarter’ by the tourist board nomenclaturists, is the Metropolitan Arts Centre just to the east of the cathedral; this opened in 2012, designed in a bold modern style, and hosts all kinds of exhibitions, performances and experimental works. Pop in for a dose of culture. The scale of everything changes when you come upon the enormity of Belfast Cathedral and its relatively austere demeanour. The cathedral, designed in the Romanesque style, has been in an almost permanent, if sporadic, state of construction since the foundation stone was laid in 1899, reflecting Belfast’s recent elevation to city status. In 1924 the west front of the cathedral was re-designed as a memorial to those who had died in the First World War. This, to my eye at least, is the most interesting part of the building architecturally, with its art deco lines and exquisite lights. Extensions and additions to the cathedral continued throughout the twentieth century, but it was not until 2007, with the addition of the stainless steel ‘Spire of Hope’, that the cathedral was finally completed. The brushed stainless steel spire, reaching 72 metres above ground level, is a distinctive landmark across the city. 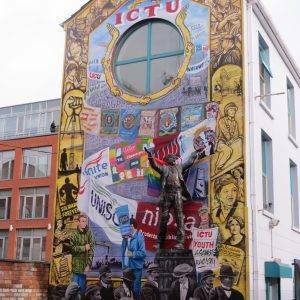 Coming back down Donegall St, there are also impressive murals to be found, including one for The Irish Congress of Trade Unions (ICTU) in Donegall St Place. Just after you turn right at the bottom of Donegall St, you will see the Old Exchange and Assembly Rooms building. Built in 1769, and converted 1845 by Sir Charles Lanyon (him again). It became fashionable for the staging of county balls and other social events such as a harp festival. In the aftermath of the 1798 rebellion, the Assembly Rooms were pressed into service as courtrooms for the trial of rebel leader Henry Joy McCracken of the Antrim Unitedmen, who was subsequently hanged in public exhibition in the High Street. This is a little-known piece of Irish history where a Protestant-led group wanted to rise against British rule in favour of a republic, and got as far as enlisting the help of the French, who were obviously experienced at this sort of thing; but alas (or fortunately, depending on your sympathies), rather like the Armada, their sea invasion was halted by bad weather. Next, we headed down Belfast Entries, a series of narrow alleyways which, when the town was first laid out in the 18th century, were densely packed residential and commercial areas. The surviving examples retain pockets of historic development. One of them, Pottinger’s Entry, which we walked down, has undergone a recent facelift as part of Belfast City Centre’s ongoing rejuvenation. One of the city’s five oldest streets, the Entry is named after a prominent local family (Sir Henry Pottinger was the first Governor of Hong Kong) and was once home to several newspapers including the News Letter, the oldest English-language general daily newspaper still in publication in the world, having first been printed here in 1737. At the High Street end is a ceramic tribute to the local newspaper trade. The small alleyway is also home to the Morning Star, a typical Irish pub which dates back to 1810 and was the terminus of the Dublin to Belfast stage coach. Cutting back through the town centre, much like any other pedestrianised town centre up and down the country i.e. 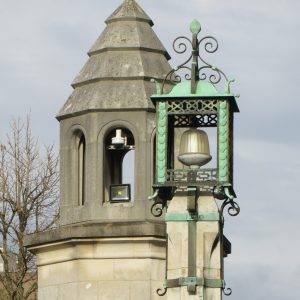 rather lacking in character, our attention was soon drawn southwards towards the massive structure of City Hall, a fine chunk of early 20th-century public statement. 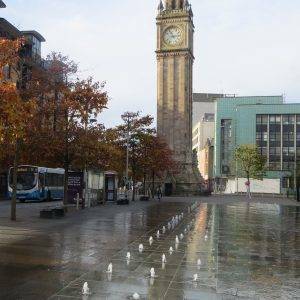 Plans for the City Hall began in 1888 when Belfast was awarded city status by Queen Victoria, in recognition of its rapid economic expansion. The building was completed in 1906. 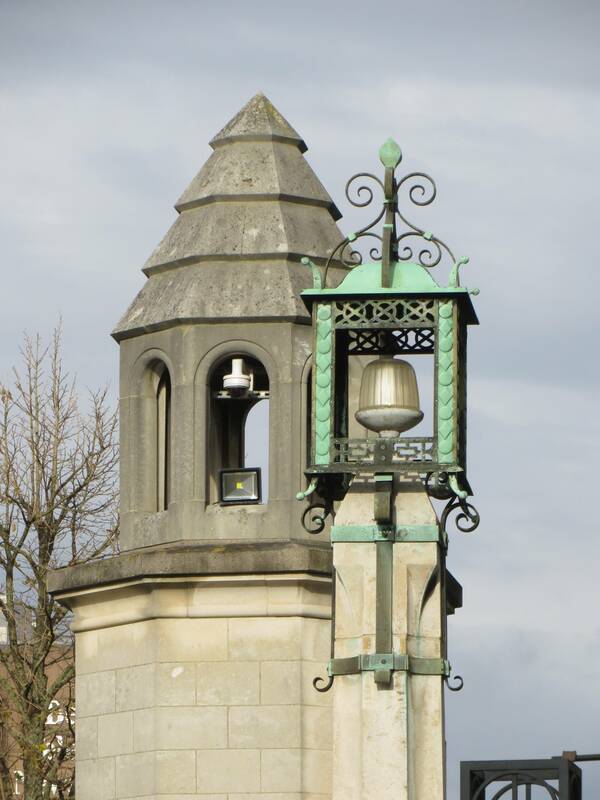 The exterior is built mainly from Portland stone and is in the Baroque Revival style. 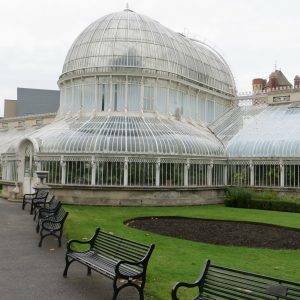 Its ‘classic look’ was copied by The City Hall in Durban, South Africa, in 1910, which is almost an exact replica; and by The Port of Liverpool Building, completed in 1913, another very close relative. Very solid, very imperious. 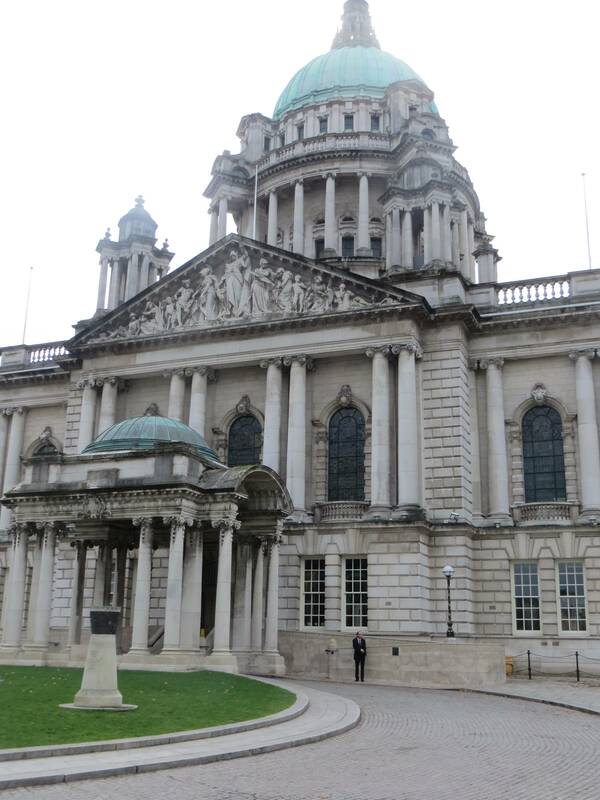 The next part of our walk took us along the main route between Belfast City Hall and Queen’s University. 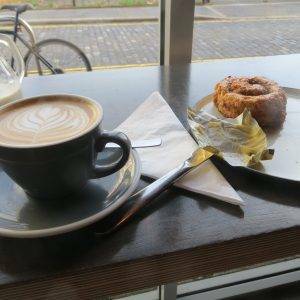 Taking in Bedford St, Dublin Road, then Botanic Avenue, it contains some of the best bars and restaurants in the city. If you are yearning for your next green space, though, you will want to hasten your step until you reach The Botanical Gardens. One building of note on the way though is the Ulster Hall in Bedford St, built in the mid-19th century and originally designed for grand dances, but now used primarily as a concert and sporting venue. Lloyd George and Charles Parnell both attended political rallies there. As you approach Queen’s University, so the average age of the pedestrians diminishes with the increasing student footfall; and the average age of the buildings heads in the other direction, as the tree-lined streets tend towards early Victorian and Georgian. Turning right along University Square, we enjoyed the continuous run of impressive Georgian properties, now most given over to lawyers, other professional bodies, university faculties and the Queen’s Film Theatre. And then suddenly you come across the full Victorian splendour of Queen’s University, set back elegantly from the road with a well-manicured lawn in the front. Breathtaking if Gothic Revival is your thing. There is a blue plaque to him outside the university; but otherwise, he does not seem to be much remembered, perhaps because of his distinct Englishness and right wing views. 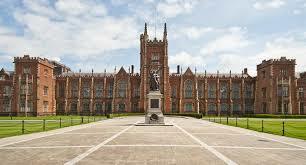 Naturally much better remembered is native Northern Irishman Seamus Heaney who arrived here in the late 50s as an undergraduate. He went on to become a Harvard & Oxford Professor and a Nobel Prize Winner in Literature. 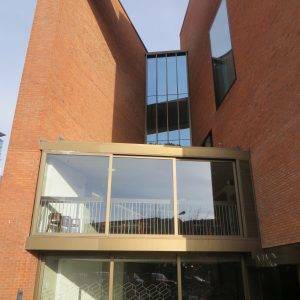 The Seamus Heaney Centre for Poetry at Queen’s, opened in 2004, is a dynamic and vibrant focal point in Ireland for the writing, criticism and appreciation of modern literature. 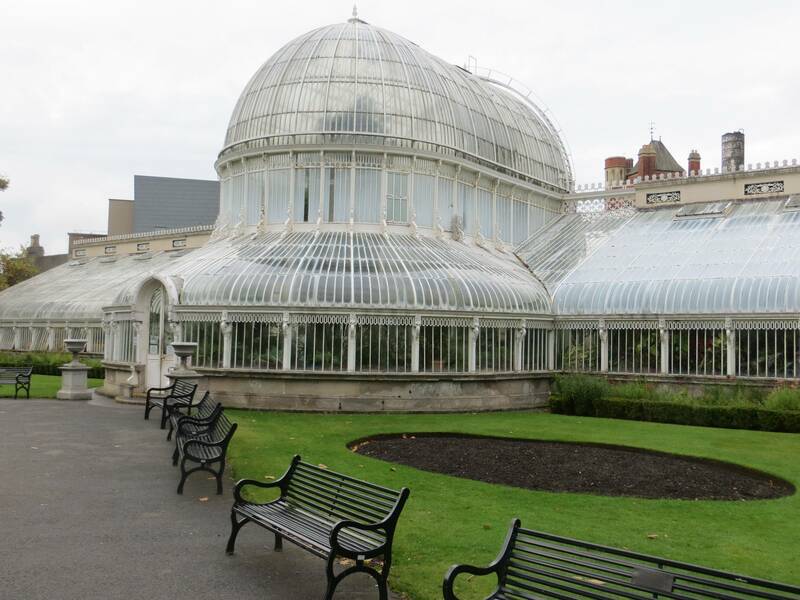 The Botanic Gardens, just beyond Queen’s, were established in 1828 by the Belfast Botanic and Horticultural Society, in response to public interest in horticulture and botany. 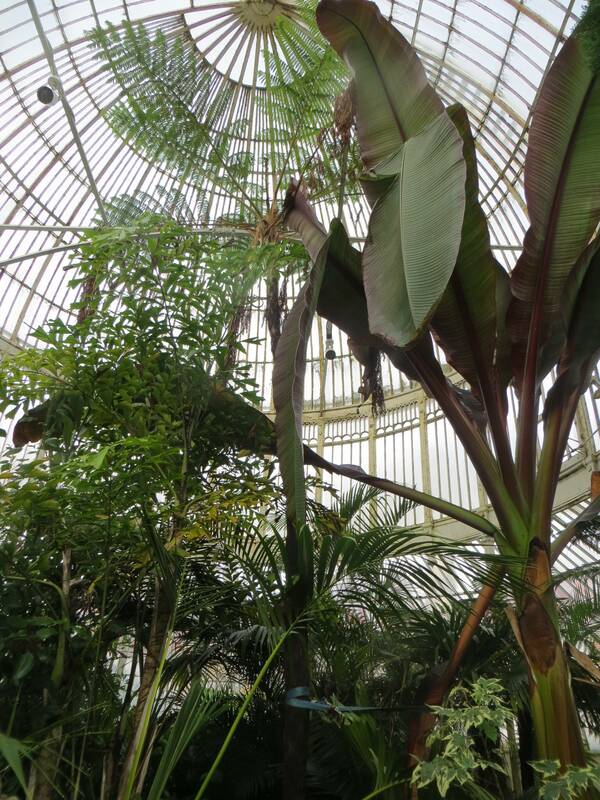 The Palm House, again designed by Sir Charles Lanyon, is one of the earliest examples of a curvilinear and cast iron glasshouse. 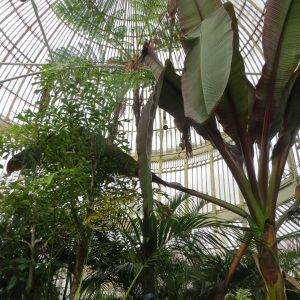 It was constructed by Richard Turner, who went on to build the famous glasshouses at Kew, which these pre-date. On a cold day, it’s a very useful pace to dive in and warm up a little, I’m sure Philip Larkin used to pop in there too to escape those ‘draughty streets’! Today, the park is popular with residents, students taking time out to discuss complicated theorems and tourists getting away from the bustle of the city; and it’s an important venue for concerts, festivals and other events. Both U2 and Snow Patrol, who originate from Northern Ireland, have played here. Just south side of the gardens is The Lyric Theatre, where film star Liam Neeson began his career in 1976. He is currently the theatre’s patron. Kenneth Branagh acted here in 2011 in the comedy The Painkiller, returning to Belfast for the first time since his youth. He had left the city at the age of nine. Commenting on his return he said: “There’s a much stronger sense that Northern Ireland is more part of the world now. I used to get the sense that there was a kind of slight siege mentality for whatever reason, a slightly chippy thing going on sometimes. But it feels there’s a very, very positive energy about the place.” We certainly felt it. Coming out of the south end of the park, we walked along Stranmillis Embankment and across the Ormeau Bridge to reach the impressive wrought iron gates of Ormeau Park (24 ha, 59 acres), opened in 1871 having been sold to the Belfast Corporation by the Donegall family estate to pay off its spiralling debt. 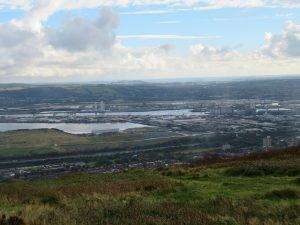 From here there are great views across the city west and up to the hills – the Divis Mountain, the Black Mountain and Cave Hill, thought to be the inspiration for Jonathan Swift’s Gulliver’s Travels. When Swift was living at Lilliput Cottage near the bottom of the Limestone Road in Belfast, he imagined that the Cave Hill resembled the shape of a sleeping giant safeguarding the city. Not hard to see why. The legendary footballer George Best was born a few streets east of this park in Burren Way in the Cregagh district; and undoubtedly would have kicked a ball around in this his local space, the biggest local area of open space by far. The next bit of our walk was the only bit of the day when I faced a possible insurrection from my walking companions. Ten minutes or so along a functional arterial road with a very uninspiring range of shops, takeaways, ‘remnant’ shops, light industrial buildings, flooring specialists betting shops etc. I was saved by the Harland & Woolf cranes suddenly coming into view again, and the Albert Bridge which would be our point of access to the river. Well, sometimes needs must with a route – and we needed to get from one green space, the park, to the next, the river, somehow. The way I see it, a city walk will always have less salubrious bits, that’s part and parcel of its charm and helps create a more complete overall impression of a place. I have always believed that there’s only one way to truly get ‘under the skin’ of a city in a short space of time, and that’s to walk it. The final bit of our walk took us alongside the River Lagan, on the Laganside Walkway which proved to be a fitting finale. We strolled past some of Belfast’s industrial past, notably the Sirocco factory just over a high embankment wall, which was finally demolished in 2009. A plaque commemorates Sir Samuel Davidson, who founded it in 1881. The business became a world leader in convection heating systems and subsequently air conditioning systems. Famously, when the German fleet was scuttled in Scapa Flow in 1919 nearly every ship was found to be equipped with a Sirocco fan manufactured here before the war. Once under the railway bridge, you will see the Waterfront Hall, a multi-purpose performance and conference facility, and perhaps more than anywhere else a symbol of the re-born city, which has hosted visits from many world leaders, including Barack Obama. Follow the Walkway all the way back to the Lagan Weir Bridge that you first crossed by, and then retrace your steps back to Titanic Belfast. 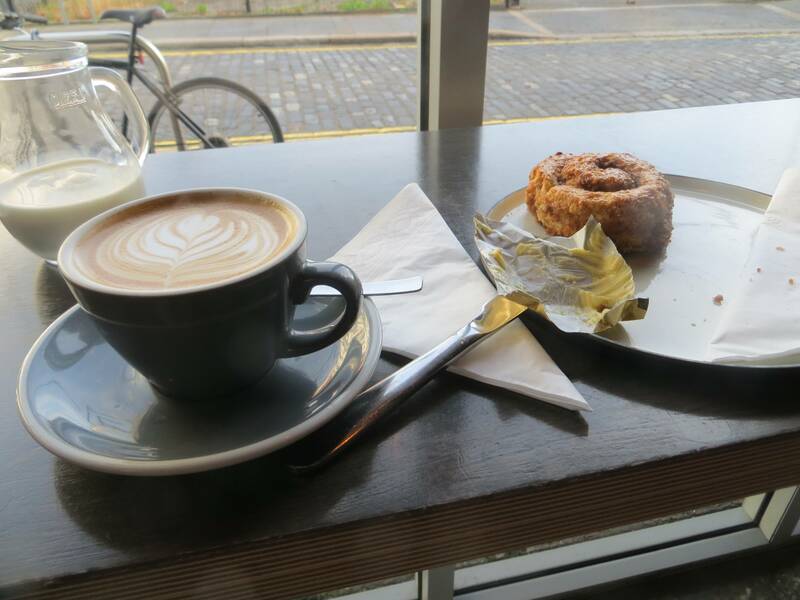 Established Coffee, 54 Hill Street, Belfast BT1 2LB (Tel: 028 9031 9416), alongside The Cathedral, offers speciality coffees and tea, luxury hot chocolate and food, such as French onion soup, freshly made sandwiches and chorizo stew. (Tel: 028 9031 3248 www.frenchvillagebakery.co.uk) Excellent breakfast, cakes and meals, open all day. The Lisburn Rd has developed into the city’s most exclusive shopping strip, sometimes known as the ‘Style Mile’ of Belfast. Designer boutiques, interiors showrooms, art galleries and speciality shops. 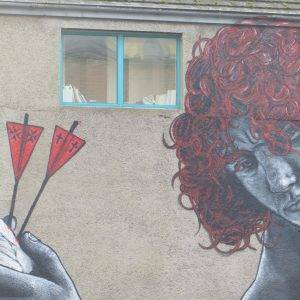 St George’s Market, 12-20 East Bridge Street, BT1 3NQ; opposite Belfast Waterfront Hall. It holds weekly Friday, Saturday and Sunday Markets, offering fresh produce and crafts. Donegall Pass is well known in the antiques world, having a few popular and well renowned antique stores in the area as well as a rich history of antique traders and stores. Oakland Antiques at 135-137 Donegall Pass, BT7 1BU is the largest and most notable of them. Titanic Belfast, 1 Olympic Way, Queen’s Road, BT3 9EP (Tel: 028 9076 6386 www.titanicbelfast.com), is the world’s largest Titanic-themed visitor attraction, located alongside the slipways where the ship was built. 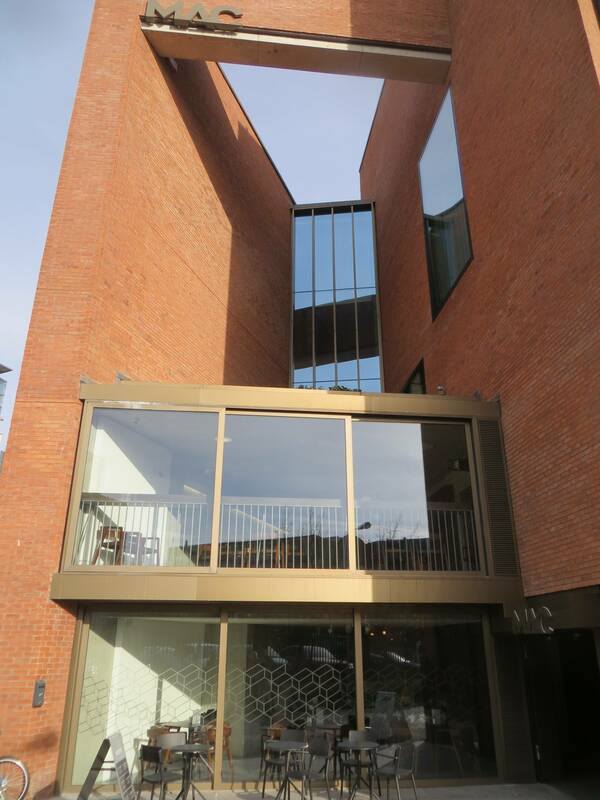 The Metropolitan Arts Centre, 10 Exchange Street West, Belfast BT1 2NJ (Tel: 028 9023 5053 https://themaclive.com) is a lovely space in which to enjoy modern art. The restaurant is also well rated; open all day from 10 am. 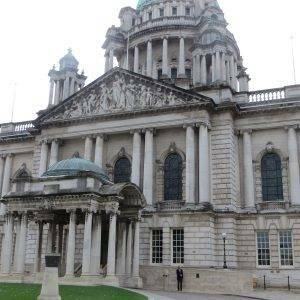 City Hall, Donegall Square, BT1 5GS (Tel: 028 9032 0202) Free public tours of City Hall are available Monday to Saturday. 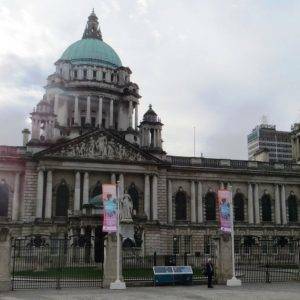 Led by an experienced guide, they last around one hour and uncover the history of Belfast City Hall, while exploring some of its finest features. Ulster Museum, Botanic Gardens, BT9 5AB (Tel: 0845 608 0000 www.nmni.com). 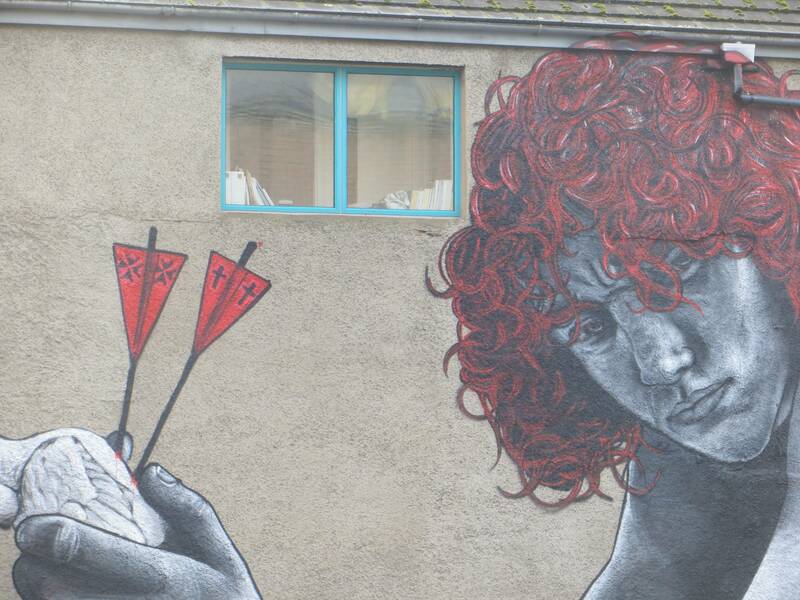 Strong on the history of Ulster, and lots of interesting art and artefacts. VISIT: Cave Hill Country Park. 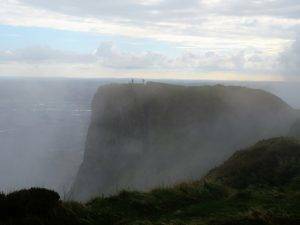 A rugged hillside park with trails leading past several caves, an ancient fort, Belfast Castle and astonishing views over the city. You can view a map here.